There are many forts in Goa, but we just had time to visit 'Aguada Fort' on the last day of the trip. 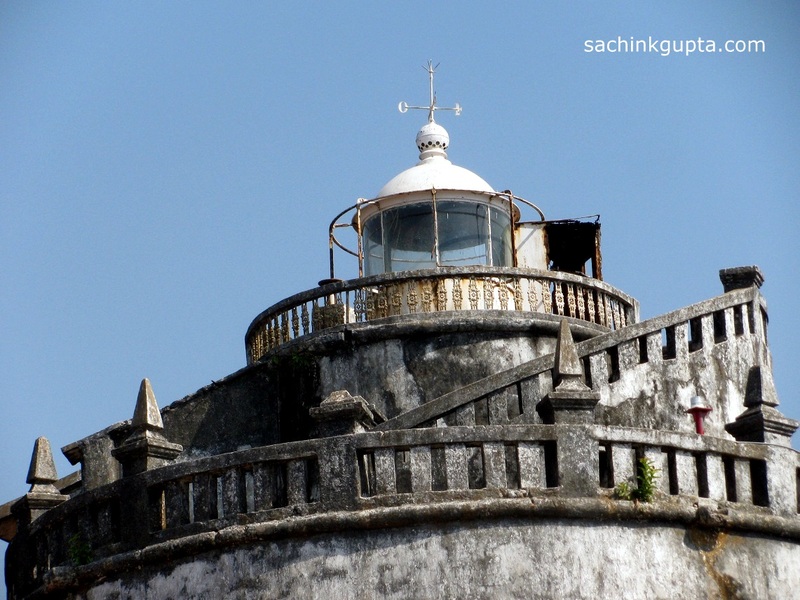 If you just came across by searching best fort to visit in Goa, you are at the right place. It was morning 8:30 am when we were on our way to Aguada fort. As the clocked ticked 9, there we were, standing at the entrance of the huge Fort Aguada and its lighthouse. It is a well-preserved seventeenth-century Portuguese fort standing on Sinquerim beach. Earlier, it was a reference point for the vessels coming from Europe. A freshwater spring within the fort provided water supply to the ships that used to stop-by. That's how the fort got its name: Aguada (Portuguese for water). A four-storey Portuguese lighthouse, is the oldest of its kind in Asia. A part of the fort is converted to central Jail. That was from history; let's not get into much of it. If you want to get a feel of ancient forts in Goa which represent strength and beauty, Aguada fort is your destination. It is worth a quick visit with its superb panoramic sea-view. The enormous fort envelops the entire peninsula at the south western tip of Bardez. Best time to visit this place is early in the morning. Outside the main entry point, you can see a small market of souvenirs and snacks. While returning we did a small hop-over at 'St. Anthony Chapel'. (Ofcourse for clicking some pics) and, this was the end of our "Trip to Go A". With our bags packed we headed back to Pune from Vasco-Da-Gama via train. Must not miss on mentioning about our fun-filled train journey; when we spent most of time playing, Tombola/Bingo, UNO, playing cards (Teen Patti -Poker with 3 cards). This is a nice place to walk early in the morning, We went in a small group of friends. We stayed here for two hours. I remembered by Goa memories. Love the place. Aguada fort is must visit in Goa. Thanks for sharing all information about places to visit in Goa. Nice photographs as well.